OSPF has been updated to OSPFv3 for IPv6. 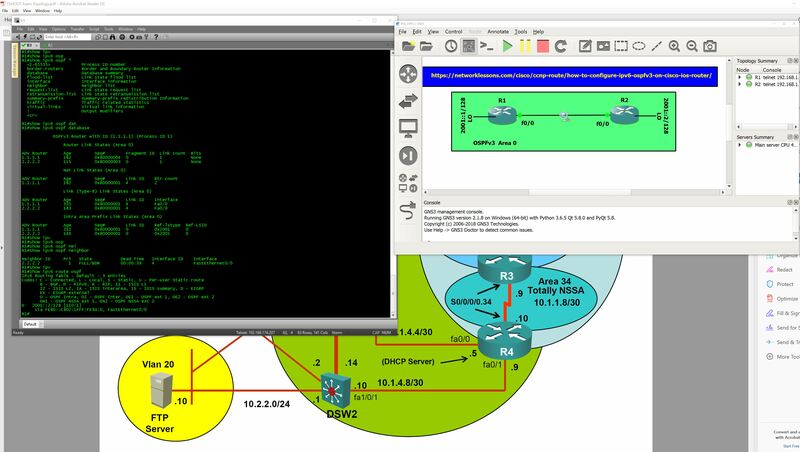 In this article you will learn how to configure OSPFv3 on a Cisco IOS router. Do areas work the same way ON IPV6 as on OSPF v2? The areas are still the same, basically OSPFv2 and OSPFv3 operate in the same way but there are some differences when it comes to LSAs, building the LSDB, addressing, etc. I’ll cover this in another lesson if you are interested. Why we use global Unicast address? isn’t it public address? I understand when its local communication we can get away with link local address and when we require routing we use Global Unicast or Unique local, right? Can we use unique local address in above example instead of Global unicast? implied we are not going to route outside it is just going to be site and inter-site based routing, so in that case we can use Unique local? Also, please show how to assign a unique local address? Just make sure it starts with FE80 and don’t forget “link-local” at the end. what is link id 8 referring to? is there a mapping to the link ip address? I will cover this in another lesson, OSPFv3 has some differences compared to OSPFv2. One of them is that each router will assign each interface a unique interface ID. This interface ID can be found in some packets like the hello packet, link-local SA and router LSA. This interface ID is also used as the link ID which you can see in the OSPF database. So we use an IPV4 Address for the Router-ID for IPV6 OSPF and EIGRP? Can you not use an IPV6 address for this? It’s the exact same thing, just use different area numbers and that’s it. I am getting this error at both router. Now if you’re using IPv4, then one of the above will be configured so you will NEVER get the above error message. If you’re using ONLY IPV6, you may have NONE of the above configured. So if that is the case, you get the error message that you observed in your configuration. To solve the problem, define a router ID using one of the above three entities. It is always best practice however, whether you use IPv4 or IPv6, to define a router ID in the ospf configuration. This will allow you to more easily identify routers in neighbor tables when troubleshooting and when changing configurations. “ipv6 router ospf” is the old way to start an IPv6 OSPF process. “router ospfv3” is the new way to start OSPFv3 with address family support.